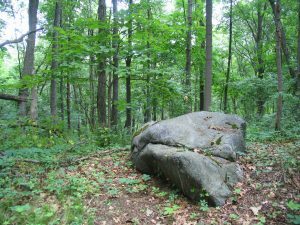 This Saturday, 10 am, ACRES hosts a hike at Ropchan Memorial, 6830 N. 750 W, Orland, IN 46776. 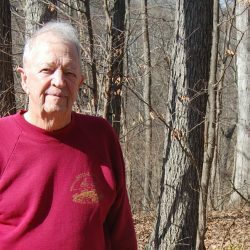 You’re invited to join ACRES’ volunteer Matt Dunno and naturalist Fred Wooley on the trail through this 80-acre state-dedicated nature preserve. This land tells many stories, stories of glacial change, of forests and wetlands and wildlife – and more. 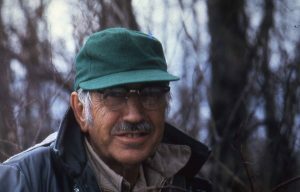 This place, along with the Ropchan Wildlife Refuge, tells an unseen inspiring story, too: the humble beginnings of Sam Ropchan, who together with his wife Adeline, donated the funds to permanently protect land in the early 1970s. Sam’s niece, Monica Kindraka Jensen, a scholar in Ukrainian Folklore, wrote to ACRES to share some of Sam’s story and how it may have formed his interest in protecting land. In 1903, Ivan and Maria (Scraba) Ropchan, Sam Ropchan’s parents, migrated from the Ukraine as pioneers, to 160 acres of untamed wilderness northwest of Vegreville, Alberta, Canada. The Ropchans were taking up an offer by the Canadian government for land in exchange for developing it over the next ten years. In 1905, Sam was born. As the second-eldest of eleven siblings, Sam Ropchan took on a fair amount of the work of tending the land at an early age. “Probably one of the key reasons Sam, when he had the wherewithal, began to purchase lands for conservation purposes in northeastern Indiana, was his experience of the unsullied prairie around Soda Lake. In retrospect, he understood that he and his family had changed it into something else. If you drive the roads around Soda Lake now, you see only wheat and canola fields, and perhaps an unruly slough that ultimately resisted draining. You must work very hard to find a clump of Yellow Lady Slippers, which, in my mother’s time, were everywhere. Sam never made it to the 5th grade. He stopped at the 4th. His father needed [him] as a farm worker. But Sam was bright, ambitious and refused to go anywhere but forward. Yes, “Semion,” named after the Apostle Simon, was a character: irascible, loveable, tough, wise, foolish. Stepping out of my narrative, I realize most of this cannot be published. I simply wanted to give a fuller view of Sam; his beginnings were humble, he rose through real adversity. I attended the dedication ceremony for the Ropchan Memorial nature preserve in 1973. Sam, standing next to Adeline, gave a small speech and then burst into profuse tears, as did she. It meant so much to him, to do this right thing. Supporting ACRES continues to be important to most of us in the Ropchan clan.